Of course this would interest me! Rose Schneiderman (1882-1972) and all of that. 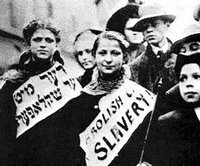 The Jewish Labor Committee has a list of interesting readings on the American Jewish labor movement. I can recommend this terrific book, called Common Sense and a Little Fire, if you're interested in the history of American Jewish women in the labor movement at the turn of the last century. 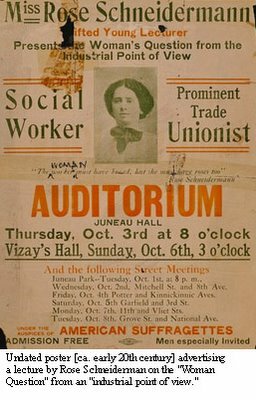 It's about Rose Schneiderman, Pauline Newman, Clara Lemlich Shavelson, and Fannia Cohn, and I read it for a class my freshman year (I think). It was this class, taken as part of my history requirement in college, that convinced me that I needed to major in History and Women's Studies. I kind of miss this stuff. This stuff being the the history of women in reform movements in the United States from the 1880s through the end of WW I and the granting of woman suffrage. It used to fascinate me, and in some ways, it still does. I think I am especially interested in the visual media from that period, and in the use of images, especially of women, to both sell and denounce ideas.